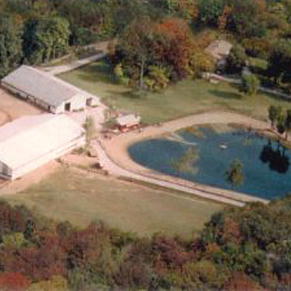 We have one of the most scenic farms in the Tristate Area. This is a view overlooking the East Fork River Valley. A complete summers horsemanship experience for horse loving girls and boys ages 7 to 17. Our stable is fully devoted to working with beginning riders through advanced. We designed an endurance saddle, which is much safer than English or Western saddles. We use a breast strap and stirrup covers, and helmets are required and provided. Two full-time instructors. Limited to six (6) children per week.